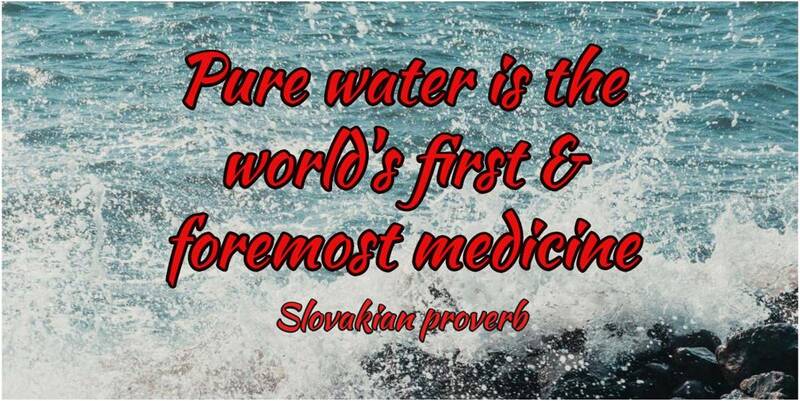 How to drink 2 litres of water a day & not drown! When the folks over at Highland Spring offered to let me have some of their water to try, I was happy to volunteer. The idea was to follow the guidelines for keeping hydrated which are to drink 2 litres of water per day and to see what if any difference it made to me. Do you know how much 2 litres is? This was one challenge that hubby could do as well. 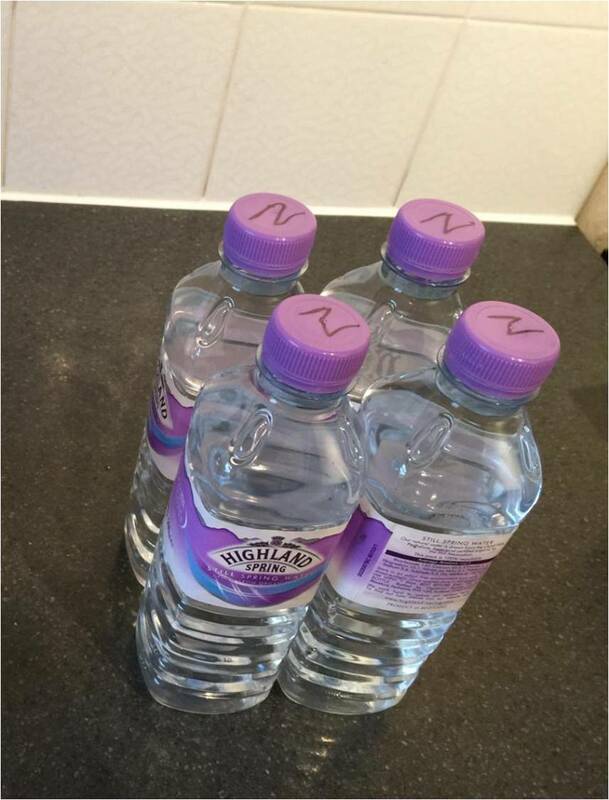 We did a little bit of research before starting and discovered that two litres are four of those small bottles. Now that I’ve written it down it seems daft but that is quite lot! Note the initial on the lid. More about that later! 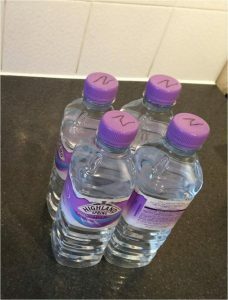 We were now going to drink 2 litres of water a day on top! Once hubby was involved, our challenge became like a military operation! First thing in the morning we got four bottles each out of the delivery we had been sent. We’d had fun storing it at first but soon had a system of moving from upstairs, to downstairs, to the kitchen. The initial on the lid signified which bottle belonged to who! Yes, it had become a competition – not to drink more than the other but to empty the four bottles each day. It was harder than it looked! Having it at the ready. 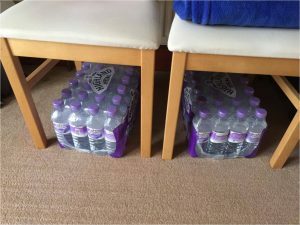 We thought we drank quite a bit of water daily but when we added 2 litres, it soon became apparent that we didn’t. We also noticed that some of our hot drinks were going by the wayside. We just reached for a bottle of water. Visits to the toilet increased but only for a short time while our systems were getting used to the increase in volume. This sounds silly when you are taking part in a challenge but when you are busy, it is easy for time to pass and you do not have a drink. Remember, our usual intake was at set points during the day. We now needed to sip often. Sitting at home with a bottle on the table or by your side was simple enough to organise. However, when you are out and about, it becomes more difficult to make sure you have a ready supply. I like to carry a small handbag which certainly would not be big enough to put a bottle in. On the days I took my bigger bag, I could pop a couple of bottles in and managed to drink both during the day. For some reason, I found it strange to carry a bottle in my hand on ‘small bag’ days but it did mean that I could share details of the challenge. Drinking water made me feel brighter. It gave me energy. For instance, when I was flagging a bit, a good drink of water made me perk up even more than a cup of coffee. I don’t possess any scales to weigh myself but feeling brighter did make me feel slimmer. Certainly having more energy meant I was more able to be up and about which is bound to help with weight loss. Happily, I don’t suffer from spots on my face but at my age, my skin can look a bit grey and blotchy, particularly first thing in the morning. With the increased water in-take I did notice a difference to my complexion. 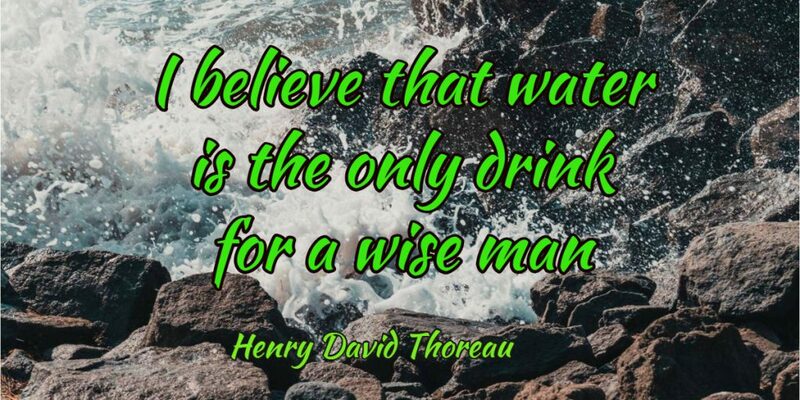 I certainly intend to try to keep up my water drinking especially over Christmas so pass my a bottle! Do you drink 2 litres of water a day? I did a fair bit in summer but not in winter. I drink weak tea and coffee and sweet, fizzy or alcoholic drinks are very rare for me. Will you continue once the Highland Spring is used up?